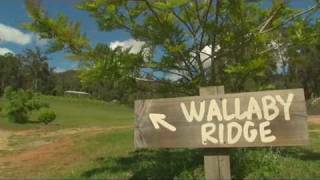 Wallaby Ridge Retreat is a Gold Coast Hinterland country escape in secluded bushland with plenty of wildlife all in its natural habitat. Six kilometres from Canungra in the foothills of Tamborine Mountain, a truly boutique experience awaits: Pool, hilltop heated spa, barbecue and outdoor room. Stunning views to the Scenic Rim and the Great Dividing Range from the self-catering suites. Two brand new cottages opened in 2016 offer a relaxing environment and a base from which to explore the beautiful rainforests, lookouts and waterfalls of Lamington, Tamborine, Beechmont/Binna Burra. Close to vineyards, horseriding, adventure activities and the charming village of Canungra. The guest house is purpose built and the Suites include luxury linen and towels, ensuite, open plan living/dining and kitchen. Included in the tariff is a generous breakfast basket of goodies for both a cooked and continental breakfast including home baked bread. The cottages are fully self contained, open plan with King beds/twin share View the prolific local birds and wildlife from your elevated veranda. Quirky locally produced artwork, emphasis on local produce and unique accommodation offer special ambience (but the peace of mind of modern facilities) in this boutique hideaway. 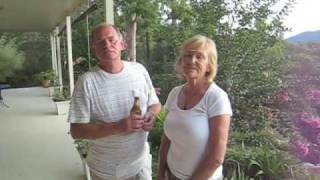 Join them today for some genuine country hospitality. There are lovely mountain views from this French country themed suite, the veranda space with tropical birch giving extra shade in summer and autumn colour. King bed (with pillowtop) bedroom with ensuite, open plan, self contained living, kitchen and dining area and facilities including wide screen television, DVD player, stereo and magazines and books. (Games, movies and more available from the common lounge). Enjoy the homeliness with the benefits of modern facilities of reverse cycle air-conditioning and mobile phone access and free wifi. Generous Country Breakfast baskets including home baked bread, muesli and goodies for a hearty breakfast. A brand new selfcontained accommodation option for those wanting more privacy and a little more luxury. King beds with pillowtops, beautiful linen, modern on trend décor, designer touches in the kitchen and bathroom and a generous 18 square metre balcony with beautiful outlook across a lush ferny valley. These will delight those looking for a hideaway with some nice tech including smart television with soundbar, preloaded with movies (bring your own music to plug and play). Full kitchen with gas top cooking, convection microwave and loaded with utensils to cover holiday stays. Generous country breakfast baskets can be ordered separately and access to laundry available for longer stays. Please enquire about rates for longer holiday stays. Architecturally inspired but incredibly energy efficient with a light footprint, the cottage offers reverse cycle air-conditioning, but the passive ventilation design and aspect gives the building opportunity to breathe naturally. They have to mention the quirky gardens and local artwork adorning this new offering highlighting their interest in growing local produce, experimentation with permaculture planting and supporting the local arts community. Self contained queen bed suite with spacious en suite and open plan lounge, dining and kitchen. Facilities include reverse cycle air-conditioning, 38 inch flat Screen television, DVD and stereo keeps you in touch with civilisation. There are self catering facilities so you can rise and eat at your leisure with the convenience of a two plate cook top, microwave, toaster and kettle. Generous breakfast basket supplied. Scenic vista from each suite, delightful veranda space with seating to enjoy the ambience. Self contained twin bed or king bed suite with spacious en suite and open plan lounge, dining and kitchen. Facilities include reverse cycle air-conditioning, 38 inch flat screen television, DVD and stereo keeps you in touch with civilisation. There are self catering facilities so you can rise and eat at your leisure with the convenience of a two burner cook top, microwave, toaster and kettle. Generous breakfast basket supplied including home grown, home baked produce. Scenic vista from each suite, delightful veranda space with seating to enjoy the ambience. Great for girls getaway, or for the elderly or someone with limited mobility.